The fallen El Comercio news crew: photographer Paul Rivas, reporter Javier Ortega and driver Efraín Segarra. TeleSur graphic. Reporters Without Borders (RSF) condemns the murder of two Ecuadorean journalists and their driver by the breakaway faction of Colombia’s FARC rebels that kidnapped them near the border between Ecuador and Colombia in late March, and calls for a transparent and exhaustive investigation by the authorities of both countries. 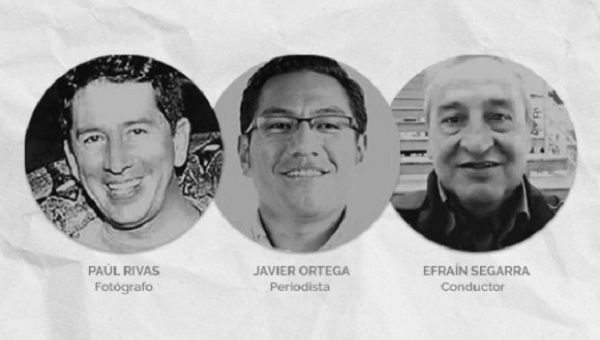 Ecuador’s President Lenin Moreno has just confirmed the deaths of reporter Javier Ortega, photographer Paul Rivas and driver Efraín Segarra. Photos apparently showing the bodies of the three members of El Comercio, one of Ecuardor’s leading daily newspapers, emerged yesterday. They and their driver were abducted in Mataje, on 26 March, a locality in the northern province of Esmeraldas that is just a few kilometers from the border. They had gone to the border region to cover the clashes between government forces and armed groups that have been under way since January. Many contradictory reports have circulated ever since their abduction was first reported. A communiqué signed by the breakaway FARC group, which was widely reproduced by media outlets and on social networks two days ago, claimed that they were killed in a military operation, a report that was at first denied by both countries, which argued that the authenticity of the communiqué and the photos could not be verified at the time. Ecuador is ranked 105th out of 180 countries in RSF’s 2017 World Press Freedom Index. Colombia is ranked 129th.